This home has it all! 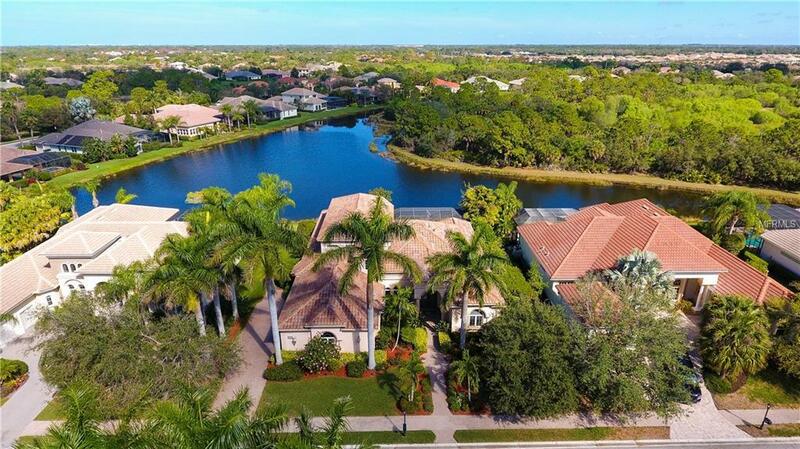 This spectacular home has breathtaking views over a beautiful lake onto a wildlife wetland habitat preserve. Todd Johnson's former model, the overall winner of the Parade of Homes, exudes elegance and incredible craftsmanship w/many upgrades, designer finishes & built-in features. This home has been meticulously maintained and offers 4 bedrooms (can be 5), 4.5 baths in a functional floor plan that would work well for multi-generational living. This gracious home features a resort style pool; free-flowing lanai/pool/spa area with outdoor kitchen & separate seating area a fireplace, absolute privacy & beautiful views. The main level master suite gives way to a luxurious bathroom w/ travertine, whirlpool bath, & walk-in shower. The private office has built-in cabinetry, fireplace, & rich wood flooring with unique inlays. The showcase kitchen boasts top of the line Dacor & SubZero appliances, island, built-in desk, butler's pantry & bar. The kitchen opens to the family room with more full water views. Two additional bedrooms w/private baths are on the main level, 1 with a separate entrance. The 2nd floor includes a huge bonus room with wet bar, bedroom, full bath, and balcony. This home has it all- located in Silver Oak in Palmer Ranch which offers convenient access to Siesta Key, shopping, and has proximity to the award winning Legacy Trail. You will want to see this fine property today! Additional Lease Restrictions Minimum Lease is 1 Year.